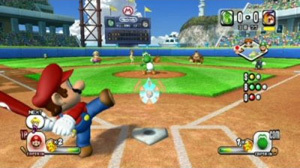 A baseball game starring Mario and friends. Bowser Jr. is taking over all of the ball parks in the Mushroom Kingdom. Mario recruits the other baseball captains (Yoshi, Donkey Kong, Wario and Peach) to defeat Bowser Jr.'s minions, recruit other team players and complete missions. You can use the Wii Remote for batting and pitching, or you can use the Wii Remote + Nunchuk or Wii Remote held sideways like a standard control pad for a more classic videogame control scheme. Each stadium has a shop where the player can buy various items, including bats, gloves and other power-ups.